Written by Parish Clerk on August 8th, 2018 August 8th, 2018 . 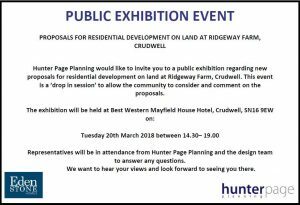 08/08/18 Crudwell Parish Council has issued the following OBJECTION comment on the proposed Ridgway development. The development site is outside the designated settlement boundary and following the 10th July 2018 Wiltshire Council meeting, is not proposed to be allocated in the Housing Site Allocations Plan. On that basis, the proposal lies within the open countryside and is contrary to both the adopted and emerging Wiltshire development plans. There is no justification for approving this application outside of the development plan process. There are no material considerations that suggest the proposal should be approved contrary to the development plan. The five year housing land supply in the Housing Market Area is above 5 years so the NPPF paragraph 14 ‘tilted balance’ is not triggered. The application site has been submitted to the Parish Council as a potential housing site and is being considered alongside others also submitted. The sewerage system is already at capacity and an upgrade is not planned by Wessex Water. It remains a long-term problem, the main sewer is too small and runs to Hankerton (who as a Parish have expressed their concerns) and onto Malmesbury. In heavy rainfall, the pumping station at Crudwell floods releasing foul waste. Crudwell has a historical issue with flooding, having two extensive floods that caused major damage to property and residents having to vacate their homes. The surface water from the existing development of 10 houses at Ridgeway Farm runs off towards The Swillbrook. Surface water pouring from the overflow pipe immediately after heavy rainfall was recorded as a video clip by concerned residents. This council was assured by Wiltshire Council planning department and the property developers that this would not happen and demonstrates that the measures put in place are not effective. The proposed flood scheme for the 39 dwellings would direct into The Swillbrook upstream of Crudwell, increasing the flood risk. The village school is at full capacity and oversubscribed, unable to enlarge their premises, and so would be unable to accept additional pupils this development would bring. Tetbury Lane is not suitable as an entrance to a large housing development. The footpath is not complete from the development to The Street. This development would increase vehicular traffic, putting residents at risk who walk this lane to access the playing fields and Village Hall. The proposed development is in an elevated position and it would be hoped a sensitive approach would be taken to possible development, given its location just outside of the Cotswold Area of Outstanding Natural Beauty and in keeping with Crudwell as a historic and desirable village. The existing development is inappropriate in materials, design and spatial layout and this theme also is continued in the proposed development. 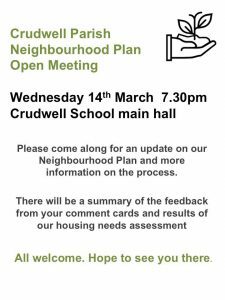 Crudwell Parish Council is producing a Neighbourhood Plan for Crudwell. This will identify a site or sites to meet the identified local housing need, preferably through small scale developments which is the preferred route confirmed through the community consultation process of the Neighbourhood Plan. Written by Parish Clerk on November 15th, 2018 November 15th, 2018 . Written by Parish Clerk on September 19th, 2018 October 3rd, 2018 .